A Silver Lining in Tiger's Tale? Scott Tinley, a retired professional triathlete and 2 times Ironman World Champion, writes about fallen heroes and teaches sport humanities courses at San Diego State University. His book Racing the Sunset: An Athlete's Quest for Life After Sport explores the world of pro athletes in transition. Fate, the Media and the Man could not have written a more compelling story. Wrought with universal themes that drew us in and begged for secret self-reflectivity, the tale opened with the Big Scene and moved very quickly into a series of delicious mysteries. Then the detailed and compelling back stories were dolled out in palatable bites. Soon enough our fallen hero was summarily deconstructed by leagues of water-cooler pundits. Everyone had their say as the lurid points of Tiger Woods debauchery lit up the technosphere as each week; a new supporting character advancing the narrative. But like a casual consumer of James Michener novels, the readers of Tiger's text were ready for a new chapter. And here it is: The Return. Borrowing from the mythologist, Joseph Campbell's Hero with a Thousand Faces, Woods' story was serialized as Campbell suggested, all heroes' journeys must be: the Call to adventure and Separation from the tribe, the Initiation that takes places while our hero lives amongst the gods and the Return with what knowledge and power they have gained. The costs for having lived an exalted experience, Campbell claims, is that the Hero must give back to his tribe that which he learned while away slaying dragons or living in golden cathedrals. So what does Woods offer us in this clipped USA Today-style example of the classic monomyth? Consider these possible lessons we might take from Woods' experience as an obviously-humbled man returns to the public eye if not a public place. 1.Our society continues to be confused about the postmodern notion of heroes. Woods plays a game mostly accessible to the elite and the entitled. His charity works notwithstanding, Woods deeds with a club are not inherently steeped in altruism. He has not stopped to enable those in need during the everyday course of life while placing himself in harms way. 2.All men are fallible. 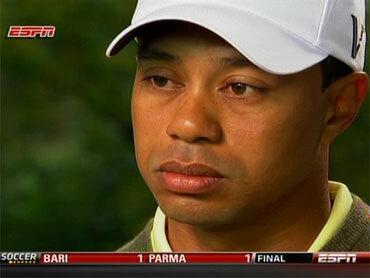 Woods recent interviews are indeed our first look at a beaten man who has come very, very far. His eyes tell a very different story then they did at his well-scripted press conference just four weeks ago. His honest penance drives us inward to taste our own mortality. And we admire him for that, as we should. 3.Golf is not the NBA or the NFL. Popular ideology suggests the power and performance sports of hoops and gridiron include a kind of cultural destiny toward off-field deviance if not promiscuity. At least we have witnessed less hand wringing among their fans when iconic players step out of line. 4.We continue to judge our heroes based on their contributions to society, real or imagined. Woods ethnic transcendence altered worn-out perceptions about access to sport and racial ideology. For that alone, he might be revered. But while there is little evidence that his indiscretions have turned minority groups further away from the game of golf, they didn't help the cause either. 5.The Greek concept of hubris--of supreme, Icarus-level confidence--has its place on the battlefields of elite and pro sports. But few players have the rare ability to control the flow as they re-enter the 'world of everydayness' and willingly de-entitle themselves. Perhaps this will be the truest test of Woods' 'rehab'. Can he find and practice real Buddhist humility while calling up the necessary hubris when he lines up a 30 foot putt before standing in a long line to rent a little fishing boat to take his kids out on a muddy Florida bog? The greatest lesson emanating from this whole imbroglio is that sports are a contested terrain well beyond any field of play. The way we think about sport, the way it gives us meaning and shapes our lives is always in play. The media, the event producers, the fans, legislatures, sponsors, players and the myriad associated commercial ventures all have specific ideas on how modern sport should function in our social, political and economic worlds. And it is up to us to negotiate our way through that minefield of messages to somehow find a place where we are happy with the state of sport and our place in it. The greatest gift that Tiger Woods could offer to a world that has treated him very well would be a capacious tell-all, no holds text of what drove him to risk all for what? Few athletes have the courage but those who have done so rave of its liberating effects. And mature consumers of sport appreciate the notion that their pain could be ours as well. Aggasi and Ashe from tennis, Lyle Alzedo from the NFL, Muhammad Ali from a lived life…each completed their Return bearing knowledge gleaned while living in a world few of us will see. Woods doesn't really owe us this any more than we owe him an explanation of our life and why we chose to adulate him. Sport connects us in ways most of will never know. But wouldn't it be nice for him to work with us in understanding those relationships?